Rudy, who was only nine years old, was indeed very young, but he could fit in the "young prodigy" category: He juggled three balls, three clubs, five hoops, and ended with sending atop his head with his foot a saucer, a cup in the saucer, a spoon in the cup, and a piece of sugar to crown it all. The manager was reluctant at first, but he eventually caved in: As the war dragged on, good performers were increasingly hard to find. Thus, Rudy made his debut in 1942 in the WinterGarten’s Christmas Show in Nuremberg, adding to his act a little acrobatic routine and some passing that he performed with his grandfather: Young Rudy stopped the show! Contracts quickly followed for some of Germany’s best variety venues, but after the United States had entered the war, Allied bombings had intensified over Germany, and in 1943, they began to hit Nuremberg, an important target by reason of its notorious Nazi history and, more importantly, since it was an important armament production center. Rupert was worried for his children and didn’t want his son to travel anymore. Rudy had to interrupt his performing activities, but he continued his training. The following two years were dismal, but despite shortage of everything, Rudy never stopped training. At the end of the hostilities in 1945, he resumed his performing for the Allied troops stationed in Germany. By 1946, his original finale had substantially improved: He could now pile up seven cups and saucers on his head. (The trickAny specific exercise in a circus act. had been invented by another juggler, Ferry Mader, one of his father’s friends.) His general technique had also improved, and he had added some tap dancing while he juggled balls, clubs and rings. His act didn’t need his grandfather anymore! In 1948, he was contracted by Circus Krone for their winter season at Munich’s Kronebau, their permanent circus building. (The original building had been destroyed by the bombings, but Frieda Krone rebuilt another circus, in wood, in 1945, right after the end of the war. The present Kronebau replaced it in 1961.) Krone was indeed Germany’s premier circus, and Rudy’s engagement definitely launched his hitherto burgeoning career—especially since it was followed by a three-year contract with the touring Circus Krone, Europe’s largest circus. Rudy Horn was only fifteen years old! His technique continued to improve: Beside his classic juggling with balls, clubs and rings, he could now pile up ten saucers and cups on his head and, with his foot, throw a coffee spoon balancing on his forehead—a rare exploit that only the very best jugglers have achieved. However, his cup and saucer routine was so popular that other jugglers began to copy it. Rudy counteracted by doing it on a high unicycle that he had to build himself, since this kind of apparatus was still hard to find. 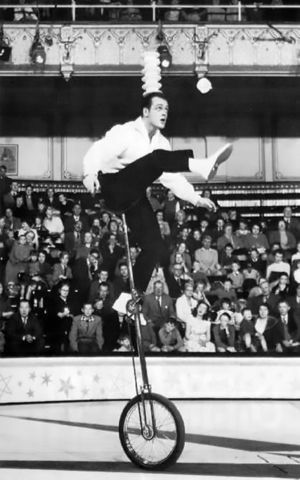 By 1950, the juggling on unicycle was part of his act—as well as juggling in rebound on a drum with seven balls. When his Krone engagement was over, he was contracted by one of Europe’s most prestigious circus shows, Bertram Mills Circus at London’s Olympia, for the 1951-52 winter season. Cyril Mills had spotted Rudy at Circus Krone, when he was still doing his cups and saucers routine on the ground; when Rupert told Mills that his son would soon do it on a unicycle, Mills agreed to hire Rudy as soon as his Krone contract was over. Rudy was the talk of the town and, after his winter season with Mills, he was featured at the London Palladium, London's most prestigious music hall. He later returned to Mills and spent three touring seasons with its tenting show, in 1953, 1954 and 1955. 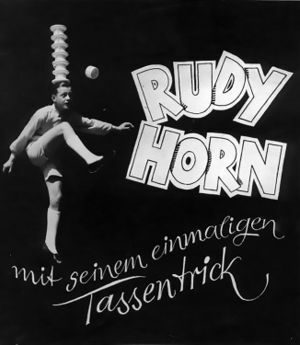 From then Rudy Horn embarked in a very successful international career, in both circus and variety. His act was featured in the most famous venues, among which the Dunes Hotel & Casino in Las Vegas, the Lido and the Alhambra Music-Hall in Paris, the Tower Circus in Blackpool and more shows at the London Palladium in England, Circus Knie in Switzerland, and toured as far as Australia and South Africa. He was also invited to perform for Queen Elizabeth II in a Royal Variety Performance at the London Palladium in 1954, and appeared on television in The Ed Sullivan Show (four times) in the United States, The Caterina Valente Show and The Freddy Quinn Show in Germany and twice in ''La Piste aux Étoiles'' at Paris’s Cirque d’Hiver, among others. He gave his last performance on December 19, 1975 at the St George’s League Club in Sidney, at the end of his last Australian tour. In 1973, he had been awarded the coveted Rastelli Prize in Bergamo, Italy, along with the Hungarian juggler Eva Vida. He also received the Bundesverdienstkreuz (the Order of Merit cross) from the Federal German Republic (West Germany) government. He retired to Berchtesgaden, in Germany, where he became a tennis coach, one of his passions along with playing the accordion and singing popular songs (he contemplated at some point having a second career as a singer). Rudy Horn passed away on October 12, 2018, at age eighty-five. He is remembered as one of the greatest and most original jugglers of the twentieth century’s post-WW2 era.